We put our members first, and that’s especially true when it comes to privacy. As the industry leader on consumer privacy protection, we guard our customer’s data like no one else because we understand that your use of the Internet is private, and that we must ensure our members feel secure. 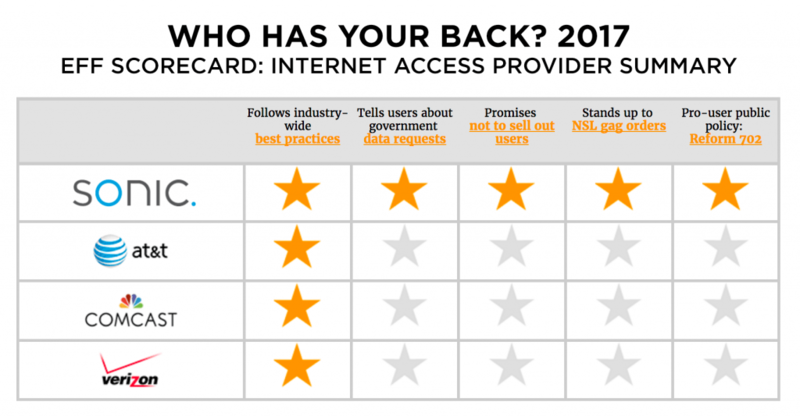 Recently the Electronic Frontier Foundation published their annual “Who Has Your Back?” report. It marks another year that Sonic has received a perfect rating, our fifth such achievement in the five years that Internet access providers have been ranked by the EFF. Each year we have been awarded a perfect score because we lead the way in industry best practices, refuse to sell our user’s data, and advocate for our customers and their privacy. For us, it’s not complicated: our members deserve an internet service provider who won’t share or sell their personal data. Leading the way on privacy. Since day one, our policies have always taken into account the best interests of our members and these policies are especially relevant now. California is currently considering legislation that would install statewide privacy rules after prior federal protections were repealed. This could mean setting a major precedent in terms of where the limits are when it comes to ISPs and the unique access they have to their users’ personal data. So, what does this proposed legislation mean for Sonic and for our members? ISPs to obtain customer permission before using or selling their personal data, permissions that could also be revoked by the consumer at any time. This would give Internet users a real choice about their privacy. Prevent ISPs from offering incentives or discounts to customers if they opt out of choosing privacy protections, along with prohibiting ISPs from turning away those who choose to have their data protected. This would mean never having to choose between protecting your personal data and receiving service. This is legislation that could set an enormous precedent in favor of privacy protections for consumers. It presents an opportunity to make a tangible, significant difference, and Sonic is in full support. With the recent attacks on net neutrality and now your privacy, we want you to make your voice heard. You can write your local representatives and let them know that you are in favor of restoring broadband privacy rules that restrict your broadband provider’s ability to sell your data without your explicit consent. And we’ll do the same. Write a letter to your representative here. But regardless of the outcome of this legislative effort, Sonic’s stance remains constant: we will never sell your personal data. We won’t change our minds or our protective policies, regardless of whether or not this legislation passes. Sonic has got your back, and that’s something you can count on. ← Net Neutrality Day — now what?